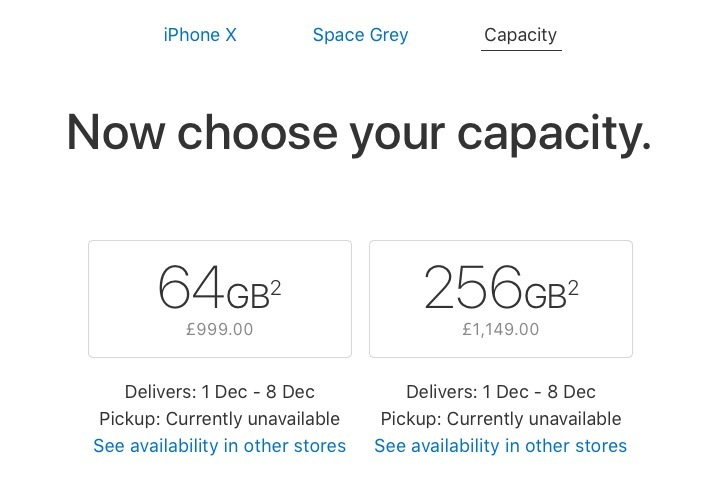 Shipping estimates for the iPhone X have improved across Europe and Asia today, with many regional online Apple stores now quoting delivery within the first eight days of December. France, Belgium, Germany, Netherlands, Czech Republic, and the United Kingdom now all show shipping dates between December 1 and December 8, suggesting Apple's production ramp-up efforts are paying dividends well beyond U.S. shores. Slight variations in shipping dates can be found in other European countries such as Italy and Spain, which show estimates between December 1 and 11. Meanwhile, Denmark, Finland, Ireland, Norway, Poland, Portugal, Sweden, and Switzerland currently give a 1 to 2 week estimate. Elsewhere, regional online stores in Asia, including China, Japan, and Singapore, quote delivery dates of between 1 and 2 weeks. The same also goes for New Zealand, while Australia now offers a more specific date range of between December 1 and 8. U.S. shipping estimates for iPhone X improved on Wednesday to 1 to 2 weeks, but prior to today, estimates across Europe and Asia remained at 2 to 3 weeks. Back in early November, Apple CEO Tim Cook said the company was working to ramp up iPhone X production week by week, with the aim of getting the new smartphone out to customers "as soon as possible." Previously, rumors had suggested the device would be available in severely limited numbers until well into next year, but the balance between supply and demand already looks to be easing worldwide. Would be amusing if the iPhone 8 started having shipping delays due to increased demand. Many people - including me - are simply not willed to pay EUR 1.400 for a cellphone. I do feel a bit sorry for Apple. I am not a mindless fanboy (far from it) but it does seem to me that if they cannot meet demand they are criticised, "Isn't Cook supposed to be a supply chain guru?" etc., and when they can meet demand, many seem to conclude the product is selling poorly and hence a failure. Fact is, this iPhone (X) is too darn expensive. I can easily afford it but prices are just insane in *some* (erm sorry) many places around the world. …except for Hong Kong, which is still unavailable. Ordered mine 27 October and delivery date is still 1 December. So basically everyone who ordered 2 to 8 units of iPhone X in the hope of selling them all for large profits are approaching their 14 days returns period. Having not sold them for more than the already absurd price tag they have returned these to Apple and the shipping estimates have all gone down. Looks like Ming Chi's supply constraint estimates were artificially inflated by people buying them not for themselves but to sell in the hope of making profit.